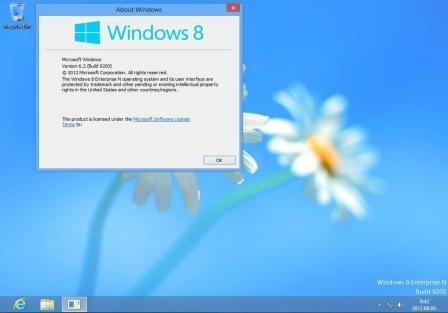 A 64-bit RTM version of Windows 8 Enterprise N edition has been leaked. Windows 8 Enterprise is the most comprehensive version of Windows 8 edition available, with several features that unique to it, such as Windows To Go, DirectAccess, BranchCache and AppLocker. The leaked Windows 8 Enterprise N edition does not include Windows Media Player or other Windows Media-related technologies. Though the feature can be installed through Media Feature Park, although it’s not available for Windows 8 yet. The initial lead was the non-bootable Windows 8 Enterprise N archive with the file name of 9200.16384.120725-1247_x64fre_enterprisen_en-us_VL_EnterpriseN-NONBOOT_DVD.rar. Then, a bootable Windows 8 Enterprise N ISo has been leaked by WZOR, allowing direct and easier installation. Note that the ISO is probably not the original ISO made by Microsoft, but a bootable ISO that contains original Windows 8 installation files. Download is available through BT, file sharing sites or simply search for torrents with the name of MICROSOFT.WINDOWS.8.ENTERPRISE-N.RTM.X64.VOLUME.ENGLISH.DVD. Windows 8 Enterprise edition is the only edition where product key is not required for installation. Hence no input of product key is needed during installation. However, activation of Windows 8 Enterprise is not possible yet for non-corporate users, and users will need to rely on rearm command to get rid of the activation watermark and for personalization to work. Other editions of Windows 8, even if leaked, are probably also uninstallable due to lack of product keys.